Ideal for strategic placement on tables and countertops, these counter top displays function well on front desks or in waiting rooms where perhaps only a side table is available for a counter display. Because table top displays are lightweight and easily relocated, they’re also superb for use at trade shows and other traveling exhibits. You can order our highly demanded 5.5x8.5"counter tops for real estate business to make your customers have a quick glance at what you have for them. Our wind plastic A frame sign are durable and wind resistant so that you can place them indoors or outdoors. Counter displays are a great source to value customer's time. Like keeping your product and services in front of the clients at all times when they are in your store so they don’t have to wait for a menu or price list. Order your 11x17" counter tops for restaurants today! Counter tops are a must-have for restaurants, real estate and other hospitality businesses because theyare a disposable and an inexpensive way to market weekly or monthly specials. Our Counter tops printing will help advertise your restaurants, bars, salon and spa, and other service business entities by letting your patrons know what your featured specials are. For trade show events, the custom 9x12" Counter top display printing for trade show will help create an attractive display card on your table to provide event agenda highlights. We offer full color signicade plastic deluxe A frame signs that are get for advertising. Hotel owners can use our standard 8.5x11" countertop displays for room service menus to advertise special services, points of interest around the city and even promote the establishment itself. Our counter displays come on 3/16" foam core with easel backs to help the display stand out. They are great for short term use so you can change your promotions and special offers accordingly. The printing and color will be on one side of the counter top display. We use self adhesive vinyl on 3/16 white Foam Board. It is lightweight material with high density and good rigidity. Counter Top Displays come with an Easel back to easily stand your display on a counter top. Easel Stands are lightweight, easy to carry and change the places. 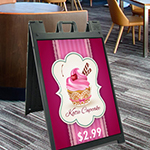 Counter top display boards are a great tool for small business owners, especially those in the start up phase, as well as for the customer centric businesses such as restaurants and agencies.The counter top displays are good to be used for a variety of applications and functions. Our counter-top display boards are useful for tradeshows, conventions, schools, hotels and restaurants. The display boards are easy to use and clean. The display boards come in a variety of styles that are great for displaying your information, advertisements, messages, and announcements. Display boards can also be used in retail and grocery stores. We provide all of these products at the lowest price and in the fastest delivery time possible. 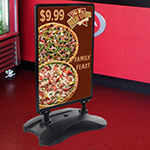 Consider the possibility of securing advertising through professional menu boards and profits or some other promotions, simply by offering information on hand with the counter-top display board printing. It's crucial that you find the perfect materials that will fit your budget effectively and give you the market exposure you desire. Your counter top display menu board is the first thing each of your customers look for, make an impressive counter display by new appearance. 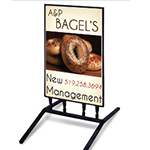 We specialize in digital printing of short run advertising counter top display signs produced directly from file. Our custom display backlit sign come in all types and sizes. 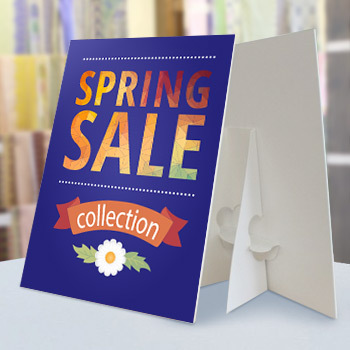 Rigid board printing has always been one of the most popular advertising medium. We offer eye catching display boards to capture your audience's imagination. Counter top advertising Board is not that costly and with the amount of exposure the product gets the money is worth it. In the past few years, several factors have triggered counter top display board advertising and cost effectiveness being one of the prime reasons. It creates brand awareness and strong name recognition which so much important for your product. I got my counter tops printed for my salon. They are really helpful. Great job. What type of display stand comes with this product? This product comes with an easel stand so that it can easily support your counter top display. -- 12" 18" -- 18" 24"
Counter Top Display Stands are printed on vinyl mounted on foam board with an easel stand on the back for display. 3/16 Foam Board is lightweight material with high density and good rigidity. Our displays, banners, signs, ridge boards and car magnets are product using wide format inkjet technology. This print technology is not comparable to offset litho printing. Counter Top Displays come with an Easel back to easily stand your display on a counter top.